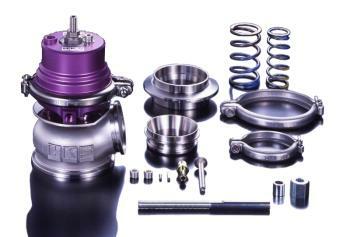 HKS GT II Wastegate UNIVERSAL - MiataRoadster - Stay tuned with MiataRoadster! The HKS GT II Wastegates are the latest in wastegate technology. They feature a lower body cast from stainless steel and an anodized purple upper case machined from billet aluminum. The GT II Wastegates weighs approximately 2/3’s the weight of the original GT Wastegate and are significantly smaller in height and width. Their compact size combined with the GT II’s V-band inlet and outlet flanges allows for versatile mounting in tight spaces. —- GT II Wastegates also include additional wastegate springs which allow for different base boost level starting points. A special tool is also included which allows for the simple installation of the extra wastegate springs. HKS GT II Wastegates are available with either a 50mm or 60mm stainless steel valve, and have base boost levels that range from 0.8kg/cm2 (11.6PSI) – 2.0kg/cm2 (29.0PSI) and 0.6kg/cm2 (8.5PSI) – 2.1kg/cm2 (29.9PSI), respectively. Like all HKS Wastegates, boost can be raised above the base boost setting by using an HKS EVC or VBC boost controller.